The Pro-Fold II is designed for multiple levels of competition from biddy ball through heavy recreational use for adults. It's an effective goal support for cross-court applications when additional baskets are needed or where attaching to the ceiling or wall is not practical. Organizations such as basketball camps, church organizations, tennis clubs and many other facilities will find that the Pro-Fold II is flexible enough for their needs. Rim elevation adjusts from 6-1/2 feet to 10 feet. The 54-inch-wide reinforced acrylic backboard provides superior rigidity when shooting bank shots and lay-ups. The Pro-Fold II is easily portable by one person. 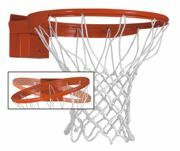 A new breakaway basketball goal, one of the first with true 180-degree deflection, is now available from Future Pro. From the left, the right or down the lane, the new Bison Baseline breakaway protects players and equipment no matter what the angle of attack. This is one of the only 180-degree breakaways with a popular positive lock release mechanism and "any angle 180 degree" of movement. The Bison Baseline is an Official Product of the National High School Federation and meets all NFHS, FIBA and NCAA rules, including the new Division One rule for rebound elasticity testing. Bison offers Sport PrideTM digitally printed wall padding, which means wall padding designs and colors now are limited only by your imagination. The padding allows full-color photo and logo reproduction in an infinite range of colors. The images are superior to vinyl stick-ons or silk-screened graphics in both picture quality and durability. They are an excellent project for booster club fund-raisers. This 2-inch-thick padding meets all applicable standards including draft ASTM standards for safety. Cutouts are available. Bison is the Official Supplier of both basketball and volleyball equipment for the National High School Federation. Draper's Top-Roll gym divider is a low-maintenance, durable solution for dividing space in facilities with low ceilings. The curtain rolls neatly and quickly on the drive pipe, with a stacking dimension of only 14 inches. Draper's clean design requires no belts, cables or complicated torsion arms. For curtains up to 100 feet wide, the Top-Roll uses a single 1-horsepower motor located on one end of the curtain, simplifying the wiring diagram and saving money on wiring. Electrical connections are made at and stay at ceiling level. The motor is mounted externally, allowing it to cool properly and reducing thermal overloads. The Advance maple flooring looks great and cleans easily. Like Shrewsbury Borough School, you can bring people in to show them the gymnasium and will undoubtedly receive compliments from parents, contractors and visitors. If you use your gym to host sports, as well as a variety of other activities, you know that safety is important, as is the durability of your flooring. You can add bleachers, auditorium chairs or cafeteria tables with no harm to the floor. The Indoor Tensioned Batting Cage by Beacon Athletics is designed for indoor use and goes up in 10 minutes. With its innovative three-pulley system, the cage can be raised and tensioned as needed. No permanent frame or overhanging cable structure remains in the facility when the cage is removed. 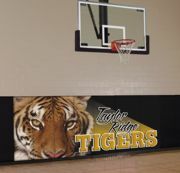 This design easily can be altered to accommodate space restrictions, bleachers or stage areas. Hide-A-Bench, Inc. is an innovative provider of a space-saving, patented, fold-away aluminum bench, which offers a great seating option to a variety of industries in the public and private sector. The Hide-A-Bench® units are designed and available as either one- or two-tier folding benches intended to permanently attach to most flat surfaces. They extend less than 6 inches from the wall while in the fold-up position, and they require less than 38 inches of floor space when fully extended. The benches can be set up quickly by one person and allow for seating up to 28 adults per 21-foot unit.